Hi there! 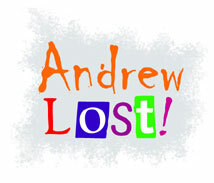 You've found Andrew Lost! Andrew is always busy making new inventions. But Andrew makes lots of mistakes, too. For example, the Atom Sucker was supposed to shrink Andrew down to insect size so he could write a great report on ants. But he accidentally shrunk himself so small he could use the period at the end of this sentence as a trampoline. He also shrunk his cousin Judy and his best friend, Thudd, a little silver robot who knows a lot. Thudd says, "Invention plus mistake make adventure!" But most people don't have adventures inside a dog's nose or on the outside of a soap bubble. Do you want to know more about Andrew's adventures? Do you want to have some adventures of your own? You've come to the right place! Find out about Andrew's world and Andrew's adventures. Read pages from the Andrew Lost books! Investigate weird true stuff like why it's good for noses to be gooey and why insects don't have noses! 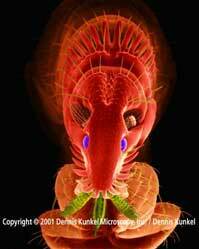 See a microscopic world you won't believe, even though it's right under your nose - and in your nose! And visit Dennis Kunkel, your tour guide to this weird world! Send in your own inventions and robots and riddles. Some of them will be posted on this site! Find Andrew and get messages! Touch pictures with your cursor! Go back and touch Thudd - and the thing on the left! You can find more Andrew fun at: www.RandomHouse.com/kids. Credits: Site created by J. C. Greenburg. Drawings from the Andrew Lost series © Debbie Palen; most black and white drawings are by Debbie. Web design direction by Fran Greenberg/DiaGraphic Design.